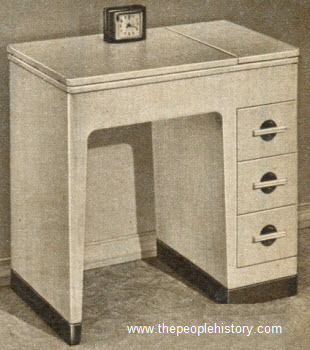 Description The Duncan Phyfe 30 by 48 inch table opens to 30 by 60 inches. Graceful table extends on gear-type slides. Semi-oval plastic top in mother-of-pearl effect green, red, sunshine yellow or dawn gray. Chrome-plated tubular steel apron... large twelve inch center leaf. 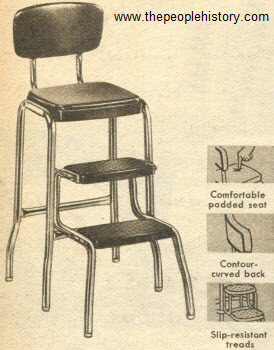 Chairs in your choice of two styles; window-back or solid back. 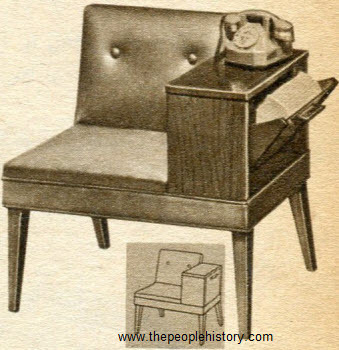 Upholstered in stain-resistant, washable vinyl plastic. Description Yours for a gay and charming informal room! Old sailing ships inspired the style. It's carried out in heavy anchors on arms, carved decorations, and in the tapestry pattern. The cover is an extra heavy, very durable, yarn-dyed cotton... comes with background in mint green, red or ivory. 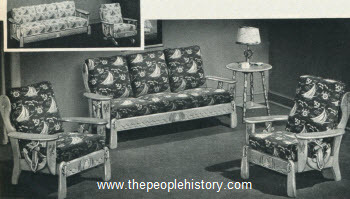 Three-Piece suite includes sofa, arm and high wing chairs. Description Studio couch in figured and plain heavy cotton cover or studio couch in smart plaid and plain heavy cotton tapestry. Three handsome color combinations: sunshine yellow and brown, dawn gray and Tuscan wine, chartreuse and mint green. Rubberized hair and cotton padding. For plaids colors are lipstick red, medium green or gray. 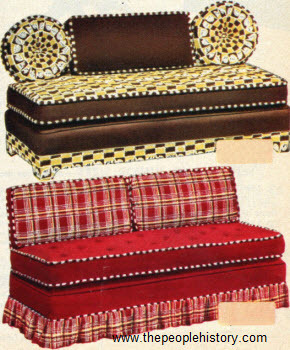 Seat and back cushions are plaid on one side, plain on the other. Smart pleated skirt. Description The newest and one of the most distinctive of the modern group of bedroom suites. Beveled wood drawer pulls provide a sure grip and add a lovely decorative touch. Beveled plate glass mirrors are large and well proportioned. 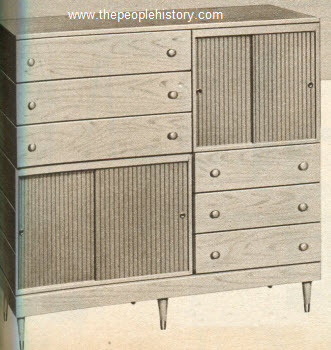 Unusual features are the pin tray in dresser, shirt dividers in the chest. Heavy plank tops with banded edges, and other fine furniture details add quality and strength. Description A beautiful and extremely useful piece of modern furniture. Divided lid opens to right and left. Hand lift head. 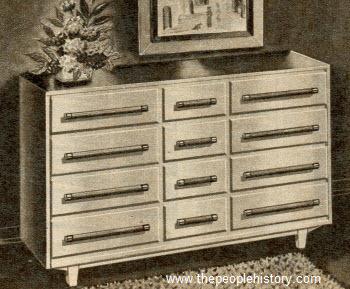 Three roomy drawers with matching pulls. Five-ply limed oak veneer. Three-coat lacquer finish. Knee sewing control. Description It's new... distinctive... different! Attractive... and mighty useful. Lovely mahogany finish. Recessed compartment for directory and note pads--closes out of the way. Fine hardwoods, mahogany finish. Washable medium green plastic cover. Comfortable padded seat. 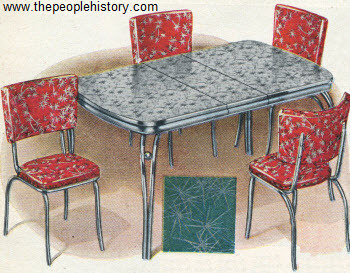 Description New unusual "starburst" design on a chrome-plated dinette set. Like sparkling stars against brilliantly colored backgrounds. Table comes in dark mint green, sunshine yellow, cherry red, or dawn gray. Three inch rounded stainless steel apron on table and matching twelve inch center leaf. 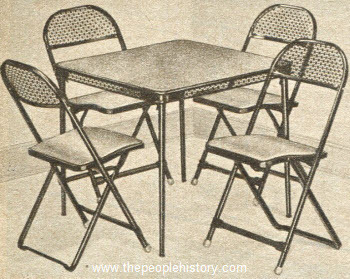 Chairs have extra-large backs with extra-deep curve for comfort. Description Long-wearing vinyl plastic cover. 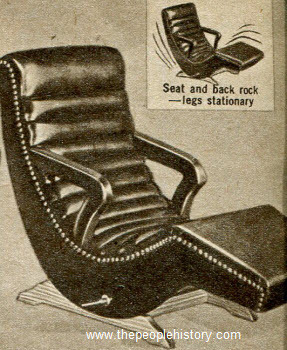 Seat, back and leg-rest--scientific one-piece construction. Body-fitting design. Thickly padded with resilient rubberized hair and soft felted cotton for comfort. Lock holds lounger-rocker in any position. Colors are mint green, cherry red, parchment ivory or saddle tan. 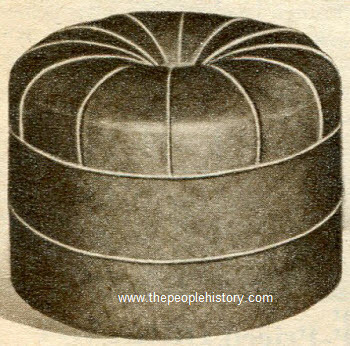 Description Popular extra-large round hassock. Huge twenty-five inches in diameter and sixteen-inches high. Thick, long-wearing twenty-gauge vinyl plastic cover. Washable. Comfortable cotton-padded top, pressure-filled excelsior bottom holds its shape. Colors are ivory, cherry red or medium mint green. Description Stylish black steel construction in a large five-piece bridge set. Open mesh steel table rails and chair backs. Large, stain-resistant plastic top. Tubular steel legs lock firmly in place and fold for storage. Rigid underbracing. 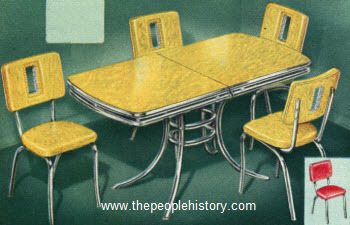 Matching steel chairs. Large fifteen by fifteen inch shaped seats. Sturdy frames have reinforced stretchers for extra strength. Mar-proof, rubber-tipped feet. Table top and chair seats covered in durable, tweed-textured plastic. Colors are cherry red or black and white. Description Curved back and seat padded for comfort... upholstered with thick Duran plastic. Resists scuffs and stain... wipes clean with a damp cloth. Strong tubular steel frame has gleaming chrome-plated finish. Legs flared and braced to stand solid under hundreds of pounds. Handy as a step ladder to safely reach those high cabinet shelves. Steps swing in and out in a single motion and lock firmly in place. Hob-nail type surface makes steps slip resistant. Cap-tipped legs protect floors from mars and scratches. Seat is twenty-four inches high and thirty-three inches high overall. Colors are gray, red, yellow or green. Description Fully assembled and ready to finish. With many features of more expensive, finished furniture. Made of extra thick select, clear-grained Ponderosa pine... seasoned and kiln-dried to resist warping. With strong, dadoed joints, smooth-sliding side-guided drawers and dust panel at bottom... helps protect garments. Dovetail joined drawer fronts help retain shape. Base rail under bottom drawer fitted into legs for extra rigidity. Description For children or grown-ups. Ideal for saving bedroom space. 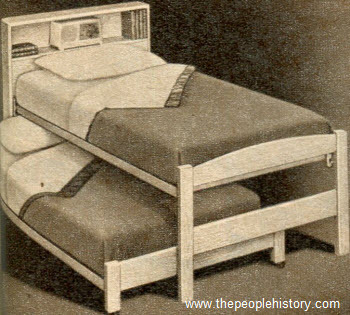 Big six-piece outfit includes bookcase headboard, trundle bed, two steel-link springs and two cotton mattresses. 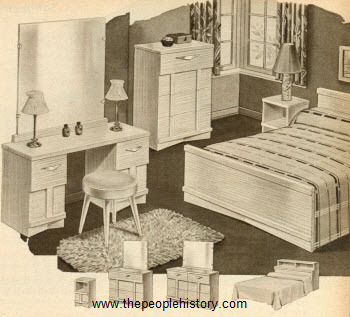 Thirty-nine inch size beds are partly assembled and have ready-to-finish Western cabinet wood. Comfortable layer-felted cotton mattresses with blue and white stripe cotton ticking. Description Dress up your home for the holidays or have a dramatic mirror treatment the year round. Window glass squares are colored black; white veining for contrast. Two protective coats. 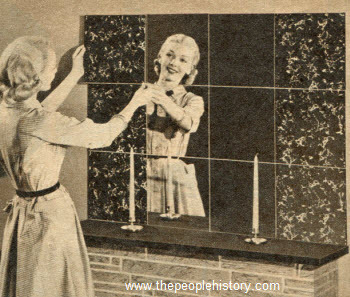 Combine black squares and regular mirror squares for a breath-taking effect. Each square is twelve by twelve inches. Use on any wall with clean bonding surface. Set of twelve squares. Description For the "host with the most".. the fellow who has everything. Made to order for the man who entertains... be it cocktail party or snacks after a skating party. Three removable, adjustable shelves hold bottles and glasses. 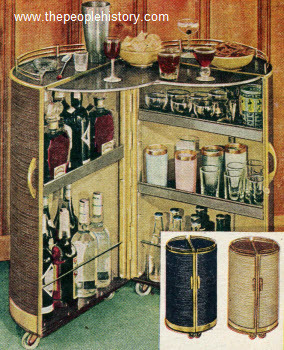 Alcohol-proof baked on enameled metal top. Sturdy steel washable plastic-coated fabric sides. Brass-plated metal trim. Choose from walnut, blonde or black. Description Rugged, durable steel bed frame, headboard spindles in smart black finish. Attractive, stylish metal scroll-work pattern in contrasting turquoise color. 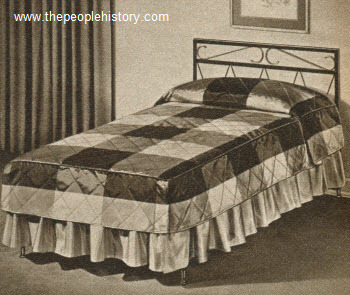 Handsome black, turquoise, yellow, and white plaid pattern mattress ticking. 152 coils insulated with resilient sisal, padded with felted cotton. For smartness, durable quality and sleeping comfort. V-design spindles in headboard and resilient steel link spring finished in black enamel. Description Change unused odd-size places into valuable drawer and cabinet space... ideal for built-ins... make unusual chests, dressers, hi-fi cabinets and more to suit your own needs. Choose from different sizes and types of pieces to create a unique storage space. Description Smart streamlined design in tune with today's modern home, just the thing for living room, rumpus room, den, enclosed porch. Resilient sag-less spring construction in seats, padded with felted cotton over mesh insulator. Backs padded with buoyant cotton. Durable heavy-gauge plastic covers resist soil, wear... wipes clean with a damp cloth. Sturdy hardwood frames rigidly joined. Gold-color welt on all seams. Legs, arm, back supports are of heavy-gauge tubular steel, durably finished in black enamel. Brass-plated harmonizing trim. Unique lattice-shape iron treatment on tops add a touch that's distinctively different. Colors are turquoise, white, or charcoal gray. 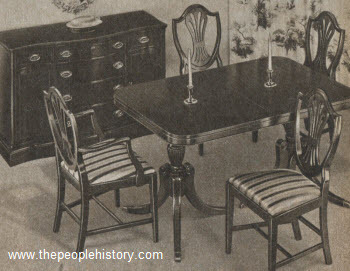 Description Dining set comes with various furniture pieces including a buffet with six drawers, a mahogany veneer extension table and could expand up to 42 by 102 inches, shield back chairs with wine and beige striped cotton and rayon fabric, breakfront china that has three drawers and two shelves grooved for plates. Description Palomino plastic made by Bolta-Flex is superior heavy-duty reinforced fabric-backed for greater durability and longer wear. Has the luxury look and feel of fine leather. Resists soiling and has rubber cushions. New transitional styling blends well with any decor. Trim button tufted back. New "Saddle" shape arms. 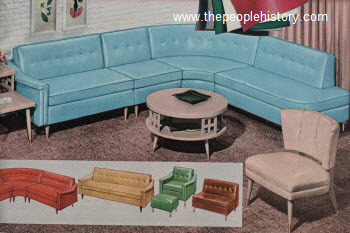 Pieces to choose from include half sofa (right or left), armless chair, curved center section, open end section, hostess chair, sofa, armless love seat, ottoman, or lounge chair. Description Highly attractive, colorful, decorator styled, quality built. New three-in-one combination unit with genuine walnut base, polished brass ferrules and trim. 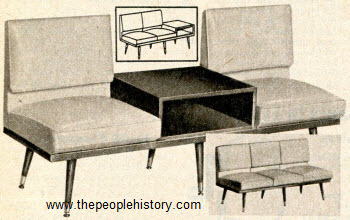 Seats and magazine table can be arranged in various ways to suit your needs. Add a look of inviting charm, color and comfort to your reception rooms, dens, lobbies and your own home. Upholstery colors include persimmon orange, coral, ivory, chartreuse, mustard yellow or tan. 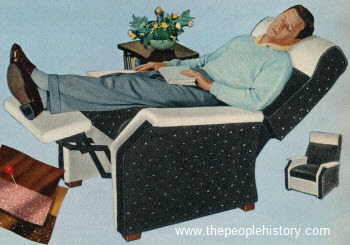 Description Wards better recliner for extra comfortable relaxing. Comes in white plastic with black fabric, brown plastic with beige fabric or saddle tan plastic with beige fabric.